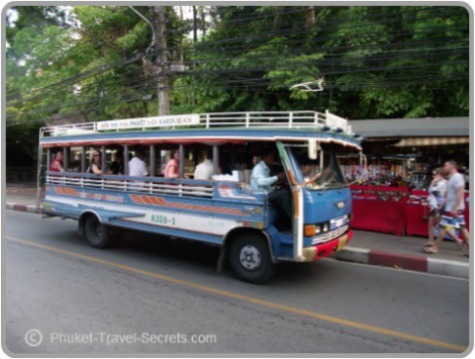 Getting around Phuket can be fun and easy if you know how, and by knowing how much to pay for your transport. The Island of Phuket is only 48 kilometres in length and 21 kilometres across, which makes it relatively easy to see the whole Island in one day. 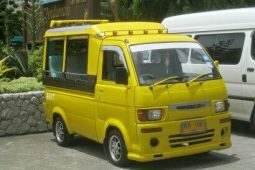 There are lots of transport options available to choose from, including air conditioned taxi's, tuk-tuks, and not to be missed on your travels around the island is a ride on one of the local buses called Songthaews. Other transport options include motorcycles or scooters, speed boats and long tail boats. If you are like us and want to get out and explore the Island, the easiest option is to hire a rental car. Read our experience on hiring a rental car. Or if you are an experienced rider, the cheapest way of getting around Phuket is to hire a motorcycle. Finding your way around the Island is relatively easy as long as you have a good map. Free maps can be picked up at the airport upon arrival or from your hotel or resort. Driving in Phuket is an experience in itself, however if your game it is the best way to see the sights and all the attractions. If you are staying around the major beachfront areas, such as Patong or Karon beaches, getting around is quiet easy. As most resorts and hotels are within walking distance to the beach, restaurants, nightlife and shopping areas. It is not until you decide that you want to go exploring other parts of the Island that you realize that the public transport in Phuket can be at times very frustrating and not to mention expensive. Songthaews are the local buses and are the cheapest way to get from the west coast beaches into Phuket Town for some bargain shopping. These buses only run through the day, making it a cheap transport option to see other parts of the Island on your way into Town. Tuk Tuks are not the cheapest form of transportation in Phuket or the most comfortable, but they are loads of fun and can be found everywhere. Longtail Boats are the most enjoyable way of getting around Phuket. Another way of getting around in Phuket is on a motorbike taxi. Motorbike taxis are convenient for really short trips, below is a clip of one of our motorbike taxi rides around Patong Beach.